Update October 9, 2017: Total War: Warhammer 2’s Steam Workshop and modding tools are now available. After being disabled for stability purposes during launch week, Total War: Warhammer II’s Steam Workshop has been switched on, so all aspiring fantasy generals can install community-made content at the click of a button. Here’s a guide if you’re playing with Total War: Warhammer 2’s Skaven rat-men. You can find Total War: Warhammer II’s Steam workshop here. Some of our favourite mods so far include the better camera mod, for enhanced camera zoom options and thus better screengrabs; Cataph’s Dragon Mages of Caledor, which adds the tabletop game’s titular fiery mages to the High Elves; and the varied dinos and varied hydras mods, which add a little more colour to some of the game’s coolest monster units. If you fancy turning your own hand to modding, owners of Total War: Warhammer II can install its SDK by clicking ‘Library’ within Steam, then ‘tools’ from the following drop-down menu. Look for ‘Total War: Warhammer II – Assembly Kit’ in the resulting menu, and install it. Here’s the announcement on Steam. Original story September 28, 2017:Happy Lizardmen, Skaven, High Elves, and Dark Elves day – it’s time to go world conquering. 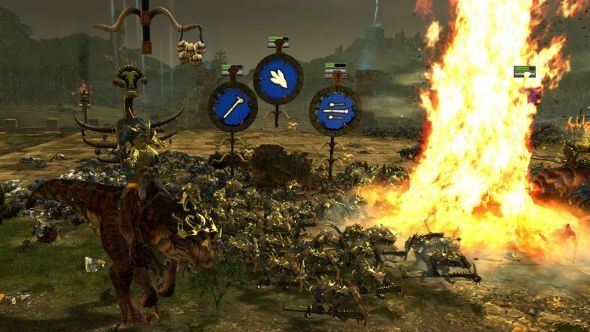 Total War: Warhammer 2 came out this morning and seems to be going swimmingly for the majority of users. No Steam review bombing about optimisation, no subreddit aflame – though it’s not time to draw conclusions yet – and 40,000+ concurrents as early as this in the day. However, Creative Assembly have disabled access to the Steam Workshop until further notice as they ensure the base game is as good as it can be. It’s not going to be a permanent situation though, with Carroll estimating that “the workshop will be up in the next few days.” She also makes it clear that mods downloaded and installed from elsewhere should still work fine, they just want to limit mods to advanced users for now to prevent error reports they can’t handle. Anyone who does find a repeatable crash – and there’s bound to be some, it being day one and all – should disable any mods and check again before flagging it up with CA. This matter was confused somewhat by the workshop going live on launch and then being taken down. Carroll says this was a mistake and apologies for any inconvenience it may have caused. As far as the biggest dramas of launch day go, this is a fairly minor one, especially compared to the original. So far, the reception to Warhammer 2 is extremely positive. Scores are high, user reviews are Very Positive, and nothing seems to have broken yet. We’ll keep an eye on sales figures and concurrent user numbers and get back to you, as always.